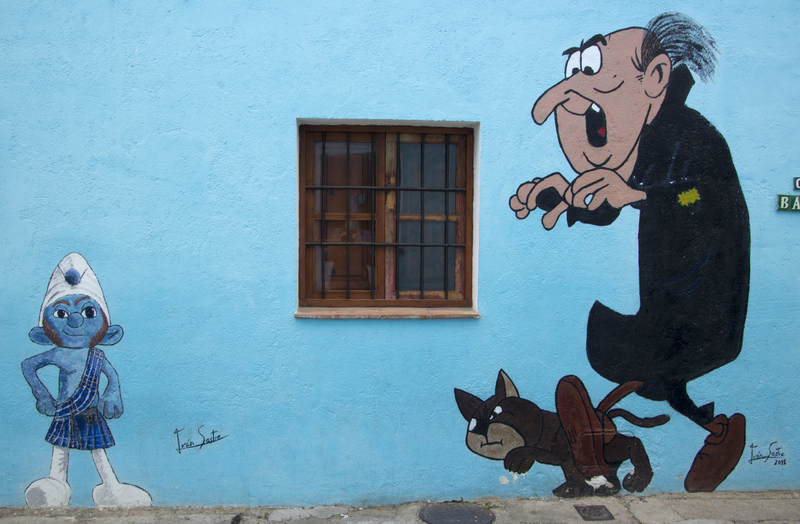 Júzcar – Welcome to Smurfville! When is a white village not a white village? When it’s a blue village! 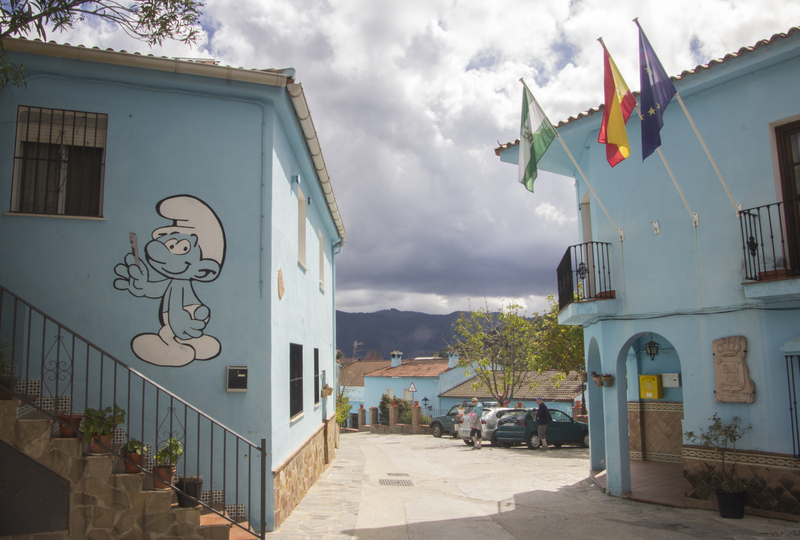 Yes, we visited Júzcar in the heart of Andalusia where we received a warm, and rather psychadelic welcome to Smurfville! It was an “interesting” drive to get there. At times the road was very narrow with a deep drop to the side but luckily there are passing places to help with road safety. Once you actually reach Júzcar, turn sharp left before entering the village and there is a lot of parking space available. Walking back up the hill you’ll find a children’s playground with a Smurf hut where information is available during the season, and a huge statue of a smurf letting you know, without a doubt, that you have arrived in Smurfville. Look across the valley and you’ll see the blue houses making up the village. Whatever my personal thoughts are, there’s no doubting the impact of this project. Visitor numbers have apparently soared from 300 a year to tens of thousands. It was intriguing (rather than particularly nice) to wander through the streets. Pictures of smurfs brought back many childhood memories, but being followed down an alleyway by a walking, talking Smurfette gave me the creeps! 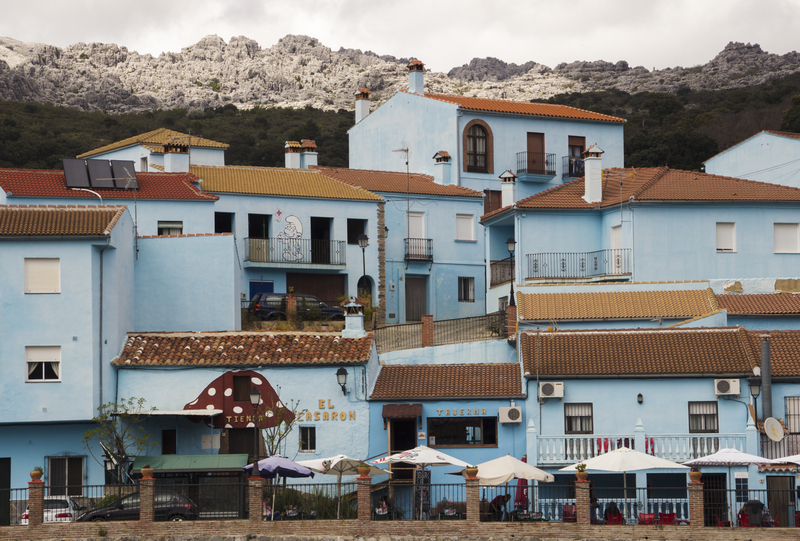 There are many photo opportunities and in the cafe you can even buy blue chocolate, made especially for visitors to this curious village. So, why have they done this? Well, back in 2011 Sony Pictures released the film The Smurfs. 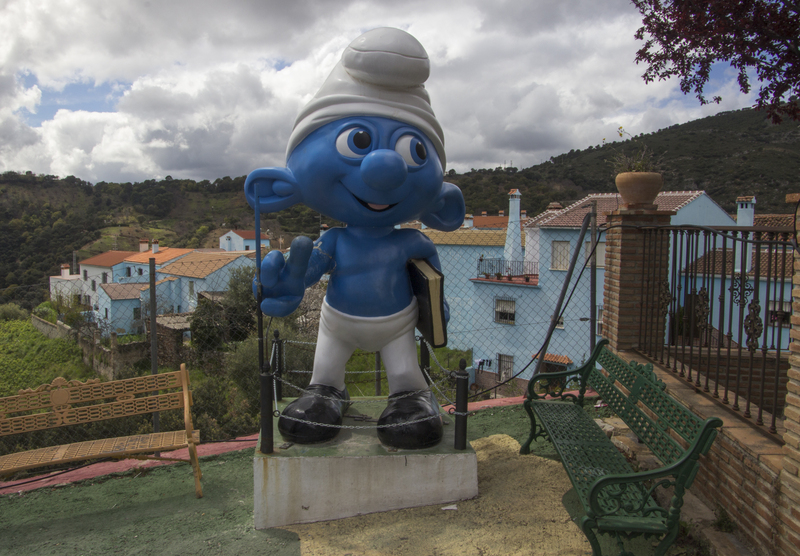 As part of the publicity surrounding the film, they sought and found a Spanish white village willing to turn itself blue and become the home of the pitufos, the Spanish word for smurfs. The economical impact of this publicity stunt resulted in the villagers deciding not to accept Sony’s offer to return the village to its previous state of gleaming whitewash. The film wasn’t shot here at all. It was solely for PR purposes that they changed colour. Was it worth the trip? I think if you are mad about smurfs, or if you have kids who are mad about smurfs, then it probably is. Otherwise it is just a curiosity and a very different place to take some photos!